SALEM, Ore. (AP) — Two dozen Democratic members of the Oregon House sharply criticized a Republican senator Friday for referencing the death of Eric Garner, a black man killed in New York by police, in a statement opposing cigarette taxes and using Garner's last words: "I can't breathe." NEW YORK (AP) — The New York Police Department hasn't been able to figure out who specifically trained an officer accused in the 2014 chokehold death of an unarmed black man because police academy records for his class didn't list instructors for individual cadets, the department said Thursday. The New York Police Department says it hasn't been able to figure out who specifically trained a white officer accused in the 2014 chokehold death of an unarmed black man because records don't list instructors for individual officers. NEW YORK (AP) — A New York City police officer accused in the chokehold death of an unarmed black man will face an NYPD disciplinary trial next May - nearly five years after the man's pleas of "I can't breathe" became a rallying cry against police brutality, an administrative judge said Thursday. NEW YORK (AP) — After he burns down the house during his current concert tour, singer David Byrne ends each show on a serious note with a song that calls attention to minority victims of violence. NEW YORK (AP) — New York City has paid $384 million over five years to settle police lawsuits. The New York Post reports on Tuesday the city settled with about 5,800 people. The majority got between $5,001 and $25,000. Democratic Mayor Bill de Blasio has vowed to crack down on frivolous claims. NEW YORK (AP) — The New York Police Department has begun disciplinary proceedings against a white officer accused in the chokehold death of an unarmed black man who gasped, "I can't breathe." A police spokesman says departmental charges were presented Friday to Officer Daniel Pantaleo. NEW YORK (AP) — The New York Police Department announced on Monday that it will allow disciplinary proceedings to go forward against a patrolman accused in the notorious chokehold death of an unarmed black man, saying it's run out of patience with federal authorities' indecision about whether to bring a criminal case. NEW YORK (AP) — A federal appeals court in New York says a lawsuit alleging the use of sound cannons by police constitutes excessive force can proceed toward trial. The 2nd U.S. Circuit Court of Appeals said Wednesday that it agreed with lower court judge who concluded that the New York Police Department and its officials were not entitled to immunity. WASHINGTON — Federal civil rights prosecutors have recommended charges against a New York police officer in the 2014 death of Eric Garner, three current and former officials said, but top Justice Department officials have expressed strong reservations about whether to move forward with a case they say may not be winnable. WASHINGTON (AP) — Federal civil rights prosecutors have recommended charging a New York police officer in the 2014 chokehold death of Eric Garner, but it's unclear if top Justice Department officials will be willing to move forward with a case, a person familiar with the matter said Friday. MEDFORD, Ore. (AP) — A ripped-from-the headlines skit sparked controversy at a community event celebrating Martin Luther King Jr. in southern Oregon. NEW YORK (AP) — The daughter of Eric Garner, whose dying words while in New York police custody became a rallying cry for national police reform, was a warrior for justice, called to the spotlight after her father died, the Rev. Al Sharpton said at her memorial. NEW YORK (AP) — The daughter of key Black Lives Matter figure Eric Garner died Saturday after a weeklong hospital stay following a heart attack. NEW YORK (AP) — Friends and activists are visiting the New York hospital where Black Lives Matter icon Eric Garner's eldest daughter is in grave condition after a heart attack. Erica Garner has been hospitalized in Brooklyn since Saturday. Family members gave conflicting reports about her status Thursday. The friend running her Twitter account posted she had suffered brain damage. Garner's mother, Esaw Snipes, tells the Daily News she's in a coma but there's a "glimpse of hope" she could recover. The eldest daughter of Eric Garner, who died after a New York City police officer put him in a chokehold, is in a coma after suffering a heart attack, according to multiple reports. In a series of tweets, Erica Garner's verified Twitter account asked people to pray for the activist. Jim Crow is back — and deadlier than ever. While cities across the nation have embraced tactics to combat urban crime, poor city dwellers, most of them black and brown, have been subjected to intense police scrutiny, routine humiliations and fatal encounters virtually unheard of in more affluent — and more white — suburbs. NEW YORK (AP) — The oldest daughter of a New York City man killed by a police chokehold has been hospitalized in critical condition after suffering a heart attack. CHARLOTTESVILLE, Va. (AP) — Director Spike Lee asked the audience at the Virginia Film Festival to observe a moment of silence to remember the Charlottesville woman killed after a car plowed through a group of protesters during a white nationalist rally on Aug. 12. The Academy Award-winning director spoke about racial issues and the country's divisive history Saturday at the Paramount Theater in Charlottesville. AKRON, Ohio - The Akron-Summit County Public Library announced on Tuesday it had canceled a program by author, journalist and frequent Rolling Stone contributing writer Matt Taibbi. The Nov. 9 program was on Taibbi's new book, "I Can't Breathe," about 43-year-old Eric Garner, a black man who died in 2014 after being placed in a chokehold by members of the New York City Police Department. NEW YORK (AP) — When federal prosecutors asked to meet last month with Eric Garner's family, it stoked speculation that their investigation into his death was finally nearing a resolution three years after his last words — "I can't breathe" — became a rallying cry for protests over police killings of black men. WASHINGTON (AP) — Civil rights groups are planning to train a legion of volunteers on how to record police encounters in minority neighborhoods in hopes that fear of being videoed will deter misconduct like illegal shootings of unarmed men and women. The Multicultural Media, Telecom and Internet Council and other groups officially announced the Santana Initiative on Thursday, which will train citizens on their rights to record police interactions with the public. NEW YORK (AP) — A judge says the New York Police Department must start using up-to-date technology to respond to freedom of information law requests. NYPD must accept and respond to information law requests and appeals by email, and provide electronic versions of records if applicable. A settlement was reached Thursday in a lawsuit filed by law student Keegan Stephan, who sought records related to the department's use of long range acoustic devices. In a last-ditch effort to show their opposition to a proposed natural gas plant in Nicetown, at least half of the 40 or so residents gathered Tuesday at a final public hearing concerning the proposed SEPTA project voiced their disapproval. NEW YORK (AP) — The family of an unarmed New York City man killed by a police chokehold said they were frustrated that federal authorities still haven't decided whether to prosecute any of the officers involved in the death. 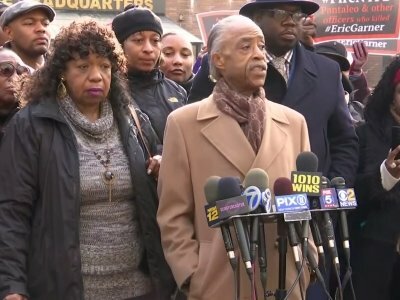 NEW YORK (AP) — The family of an unarmed black man killed by a police chokehold is set to meet with Department of Justice officials with the outcome of the high-profile federal investigation of the case still unknown, the department confirmed Tuesday. Eric Garner's family said in a statement that the closed-door meeting would take place on Wednesday at a Brooklyn hotel. More than 50 people gathered at City Hall’s North Apron this week for a Say Her Name rally, an event recognizing and honoring nearly two dozen Black women killed by police. NEW YORK (AP) — A federal judge has ruled the New York Police Department's use of sound cannons could be considered a form of excessive force, and a lawsuit against the department can proceed. Judge Robert Sweet ruled Wednesday there is a "cognizable claim" the plaintiffs' constitutional rights may have been violated by excessive use of force. LAS VEGAS (AP) — A neck hold that police used on an unarmed man at a Las Vegas Strip casino over the weekend was used an average of about once a week last year amid a national debate about the technique that is banned in many cities. Police call it a "lateral vascular neck restraint" that involves an arm around the neck to subdue suspects. Critics call it a difficult-to-perform physical maneuver that should not be used. Michael Slager now sits in jail as a convicted felon, much like the person who occupied his cell before him. But unlike Dylann Roof, the mass killer whose death sentence was broadly expected, Slager's fate will remain a mystery until a judge decides it. The 43-year-old black man died in July 2014 in New York City after a white officer placed him in a chokehold during an arrest for selling loose cigarettes. A grand jury declined to indict that officer, nor any others involved in the arrest. The city agreed to pay a $6 million civil settlement. PRINCETON &mdash; The first time they talked in school about race was in Mr. Campbell&rsquo;s 10th-grade AP U.S. history class. It was the fall of 2014, after a summer when the deaths of Michael Brown in Ferguson, Mo., and Eric Garner in Staten Island, N.Y., had thrust race back into the national spotlight. DENVER (AP) — Denver city councilors have approved a nearly $1 million settlement with the family of a teenager who was shot and killed by police while driving a stolen car toward an officer in 2015. The proposed settlement in the January 2015 of Jessica Hernandez was announced by city officials last week. City councilors voted unanimously to approve it Monday without comment. DENVER (AP) — Denver officials announced Wednesday that they reached a settlement to pay nearly $1 million to the family of a teenager who was shot and killed by police while driving a stolen car toward an officer in 2015. NEW YORK — A state appeals court has ruled that civilian complaints made to a police watchdog agency about the white officer involved in the chokehold death of unarmed Black man Eric Garner should not be made public. NEW YORK (AP) — A state appeals court has ruled that civilian complaints made to a police watchdog agency about the white officer involved in the chokehold death of unarmed black man Eric Garner should not be made public. An earlier court ruled that the Civilian Complaint Review Board records of Officer Daniel Pantaleo could be made public. It said the agency is not part of the New York Police Department and therefore not subject to a state law that restricts the publicizing of personnel records. NEW YORK (AP) — A police watchdog agency investigator who leaked the disciplinary record of a white police officer involved in the chokehold death of unarmed black man Eric Garner resigned on Thursday. The investigator, who was not publicly identified, worked for the Civilian Complaint Review Board for less than a year and had no role in the investigation of any of the disciplinary cases against Officer Daniel Pantaleo that were leaked to the website Thinkprogress.org, the board said. NEW YORK (AP) — A federal civil rights investigation into the police chokehold death of Eric Garner has been moving forward in New York, but its future is uncertain as a U.S. attorney general with a law-and-order bent takes over the Justice Department. Two people with inside knowledge of the probe say a federal grand jury in Brooklyn met as late as last week to hear testimony about Garner's deadly confrontation with New York Police Department officers on Staten Island in 2014. NEW YORK (AP) — A New York appeals court has heard arguments for and against releasing the disciplinary records of the officer at the center of Eric Garner's chokehold death. The New York Post (http://nyp.st/2jd7a5C) reports that one judge on the panel asked Thursday why jurists' disciplinary records are public but not officers'. A lower court judge has ordered the records' release. A South Carolina judge declared a mistrial after a jury deadlocked in the murder trial of a white ex-police officer in the shooting death of Walter Scott, an unarmed 50-year-old black motorist. Prosecutors promised to retry 35-year-old Michael Slager in the April 4, 2015, shooting death. The judge had said the jury could also consider a lesser charge of voluntary manslaughter. NEW YORK (AP) — The ex-head of the agency charged with investigating police misconduct allegations says New York City's mayor shouldn't keep its records secret. Richard Emery writes Friday in the Daily News (http://nydn.us/2grYCb0 ) that city lawyers told him not to disclose investigation outcomes. Police officials stopped providing NYPD disciplinary proceeding outcomes earlier this year, though they'd previously done so for decades. ST. PAUL, Minn. (AP) — A Minnesota police officer who shot and killed a black man during a traffic stop in suburban St. Paul this summer has been charged with second-degree manslaughter. Democratic presidential nominee Hillary Clinton made a campaign stop in Raleigh Sunday afternoon. Clinton visited St. Augustine's University, where she encouraged audiences to vote early while discussing the many plans she would pursue if elected in November. Clinton discussed how, as president, she would help to reform the country's social justice system. Democratic presidential nominee Hillary Clinton will make a campaign stop in the Triangle on Sunday, just days after her running mate, Tim Kaine, campaigned in Durham. Clinton is expected to encourage early voting while joined by a group of women whose children died either in police custody or as a result of police actions. ATLANTA (AP) — Philando Castile. Eric Garner. And now Terence Crutcher. Each was a black man killed in a confrontation with an officer, with the aftermath captured on video. And each time, the video leaves the impression of a wounded man left to die alone, with no sense of urgency to try to save him.